ASSA AGM Tuesday 17 July – all residents invited! Too much traffic? Too much crime? Too much filming? Too little ‘getting to know the neighbours’? Whatever your concerns, if you live in Albert Square, Aldebert Terrace, St Stephen’s Terrace or Wilkinson Street, you are very welcome to attend the annual general meeting of ASSA and raise the issues that affect you, and ideas for how we can improve our area. You will also have the opportunity to get involved through joining our committee, which takes up local issues and organises events and activities for our residents. We have invited our community police team and local councillors to attend, as well as a representative of the Lambeth Film Office, which organises location filming in the area. The ASSA committee will report on its work throughout the last year, the police will present a crime report and everyone will be invited to raise the issues to pursue in the next year. We are very keen to have local residents take part in the work of ASSA through joining the committee and helping to shape our work and activity for the future. So don’t be shy – whether you are a new resident or have lived here for an age, and whatever your age or the home you live in, please do get involved. If you want more information on the work of the committee, please contact Rosemary on 0779 290 1295 or Brenda on 020 7735 6087. The ASSA residents came out and decorated the Square, putting up marquees, lugging tables and hanging up bunting. Then out came the food, more people arrived with more food and every had a very lovely and convivial time. Our Big Buffet was held on the Monday, rather than the Big Lunch Sunday so as not clash with the Jubilee River Pageant. In doing so we somehow managed to get the best of the weather and did not even need the marquees.We were extraordinarily fortunate. Neighbours and friends brought out wonderful food to share and then sat down and caught up with goings on. The event kicked off with local children press ganged at short notice to play the National Anthem. It was lovely to see residents new to the area pitch up and enjoy themselves. The children ran around the Square garden, playing games or interrogating adults to get answers for the Jubilee Quiz. Congratulations to Coco for her investigative work leading to 100% correct answers. It was a very relaxed, warm, laughter filled time. Thanks to everyone who turned up, who made delicious food and made the afternoon a delightful event. 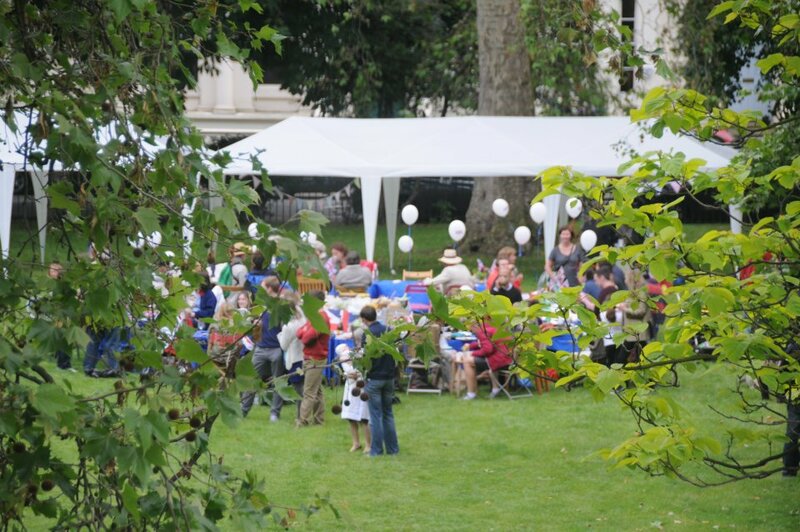 We’re looking forward to welcoming as many as possible of you local residents, your families and friends to the Big Buffet taking place on Monday 4th July, from 1.00pm to 4.00pm, in Albert Square Gardens. Do come along and bring some food and drink for yourselves and to share with others. Let’s have a really good turn out! You might need an umbrella, too – or better still a gazebo, if you have one! For further details, here’s a copy of the flyer we put through people’s letter boxes.